Todd Pacific Shipyards Corpora- tion, it was announced recently by Len M. Thorell, vice president and general manager. Window Crank-Operated c-— Window ah. 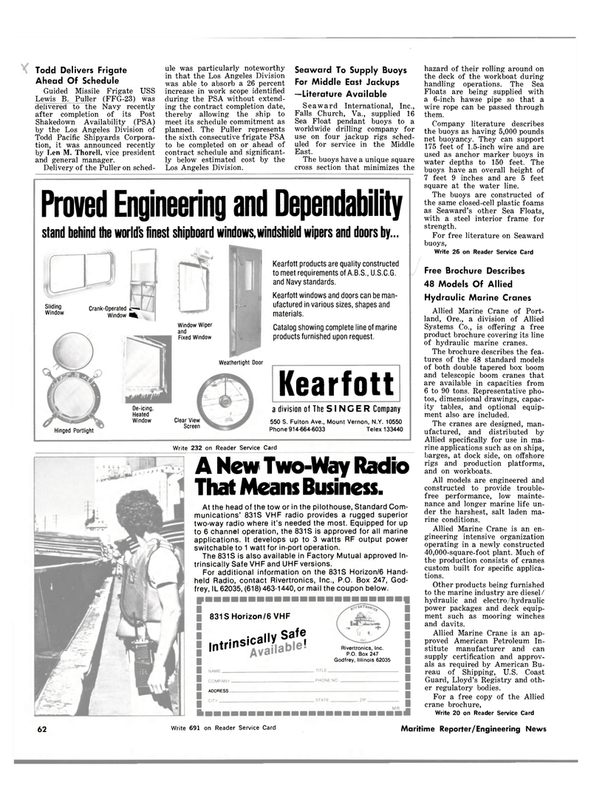 Kearfott products are quality constructed to meet requirements of A.B.S., U.S.C.G. and Navy standards. Kearfott windows and doors can be man- ufactured in various sizes, shapes and materials. Catalog showing complete line of marine products furnished upon request. At the head of the tow or in the pilothouse, Standard Com- munications' 831S VHF radio provides a rugged superior two-way radio where it's needed the most. Equipped for up to 6 channel operation, the 831S is approved for all marine applications. It develops up to 3 watts RF output power switchable to 1 watt for in-port operation. The 831S is also available in Factory Mutual approved In- trinsically Safe VHF and UHF versions. For additional information on the 831S Horizon/6 Hand- held Radio, contact Rivertronics, Inc., P.O. Box 247, God- frey, IL 62035, (618) 463-1440, or mail the coupon below. 831S Horizon/6 VHF mtrinsicany safe. Floats are being supplied with a 6-inch hawse pipe so that a wire rope can be passed through them. Company literature describes the buoys as having 5,000 pounds net buoyancy. They can support 175 feet of 1.5-inch wire and are used as anchor marker buoys in water depths to 150 feet. The buoys have an overall height of 7 feet 9 inches and are 5 feet square at the water line. The buoys are constructed of the same closed-cell plastic foams as Seaward's other Sea Floats, with a steel interior frame for strength. Systems Co., is offering a free product brochure covering its line of hydraulic marine cranes. The brochure describes the fea- tures of the 48 standard models of both double tapered box boom and telescopic boom cranes that are available in capacities from 6 to 90 tons. Representative pho- tos, dimensional drawings, capac- ity tables, and optional equip- ment also are included. Allied specifically for use in ma- rine applications such as on ships, barges, at dock side, on offshore rigs and production platforms, and on workboats. All models are engineered and constructed to provide trouble- free performance, low mainte- nance and longer marine life un- der the harshest, salt laden ma- rine conditions. Allied Marine Crane is an en- gineering intensive organization operating in a newly constructed 40,000-square-foot plant. Much of the production consists of cranes custom built for specific applica- tions. Other products being furnished to the marine industry are diesel/ hydraulic and electro/hydraulic power packages and deck equip- ment such as mooring winches and davits. Guard, Lloyd's Registry and oth- er regulatory bodies.